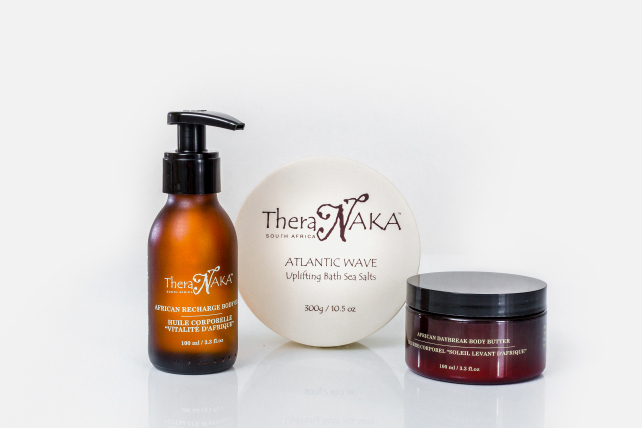 Energise and refresh your body and mind with the invigorating fusion of Lime, Sweet Orange and Lavender embedded in a selection of an anti-oxidant rich butter, Marula bath or body oil and mineral infused Atlantic Sea Salts. The aromatic blend of essential oils allows for the ultimate therapeutic experience while reviving a weary spirit. Description: A silky textured botanical synergy body oil which invigorates the mood, mind and body and helps create a sense of upliftment for the soul. Important Ingredients: Marula Oil, Lime, Sweet Orange. Directions for use: Massage body when needed using upward circular massage movements. Description: : A rich textured uplifting synergy of Avocado, Shea Butter and Mongongo Nut oil, this rehydrating medium is ideal to nourish and feed the skin, uplift the senses and leave you feeling completely refreshed. Important Ingredients: Mafura Butter, Lime, Sweet Orange, Mongongo Nut Oil. Description: Mineral rich sea salts, containing a powerful blend of uplifting essential oils and complimented with dried Chamomile flowers is the ultimate revitalising bath experience that leaves you feeling physically refreshed and emotionally enriched. Important Ingredients: Atlantic Sea Salts, Lime, Sweet Orange. Directions for use: Pour 1/3 of contents under running bath water. Relax in the bath and enjoy the aroma.